Bold and beautiful are words that describe our stoles. Keep your graduation wardrobe fresh and inspired with the right accessories. Gradshop.com offers stunning stoles in the most popular bright vibrant colors! Whether you call it a sash or a stole, faculty members and graduating students are seen wearing them in commencement ceremonies. 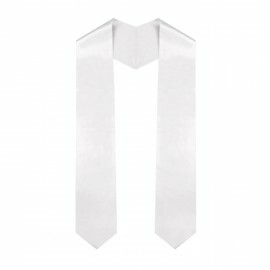 Our premium stoles are made from high quality bridal satin, tip style at the ends, shaped to fit all body types, fully lined throughout, and individually packaged. With the color variations and significance of colors, it is always important to check with the organization or school because each color represents a different meaning and purpose. Generally, the color of the stole signifies the graduate’s field of study such as Pink for Music and Silver for Speech, Chiropractic, and Oratory. Stoles can also represent membership to a particular fraternity, sorority, or academic organization. Let our graduation stoles complement your Academic Regalia. We are confident you will find the perfect color stole in our vast selection. Gradshop.com’s stoles provide an extra touch of class and sophistication helping to make your graduation memorable. Combining top quality, style and craftsmanship with unbelievably low prices, Gradshop's graduation stoles are certain to be your top choice. They may be purchased separately or purchased in large quantities to receive huge bulk discounts. If you’re not sure which stole is right for your graduation, please contact us and one of our graduation specialists will gladly help you find the right stole for your graduation. Order now! Get in touch with us right now!